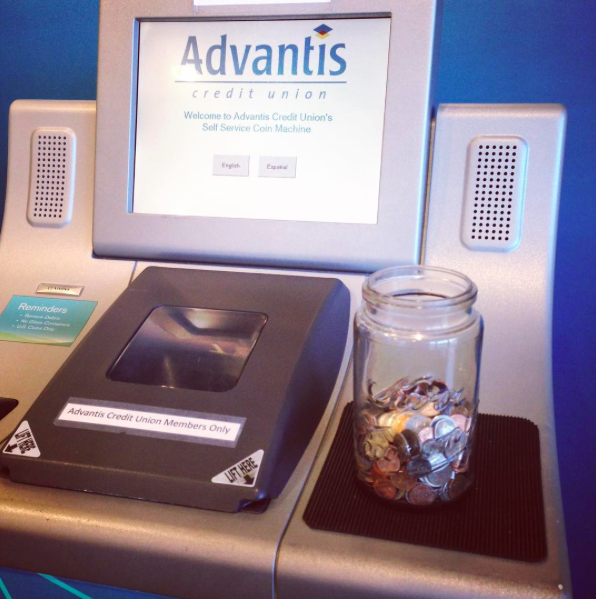 Every year I save found change in a jar to pour into my credit union’s free coin counting machine. I call it The Found Change Challenge. Some years have been as high as $56.54, (which was skewed by finding a twenty dollar bill on the ground in front of The Whitney Museum, causing me to annoy those around me by repeatedly saying “I’ve recently come into some money.”) Unfortunately, 2016 did not provide as generously, and my grand total for 2016 was a measly $19.23. However, I did raid the jar for bus money a couple of times, so you can add an extra $4.50 of quarters into this total, so . . . let’s call it $23.73! But I have a feeling that 2017 is going to be much better as A) I found a quarter at the grocery store yesterday, and B) My kids are away at college, so they don’t need bus money. Did you participate in The Found Change Challenge? If so, how much money did you find throughout the year? Please share your totals in the comments section below. My husband and I have been married for over 40 years, and I did not know that he picks up coins! About 17 cents, but it made me 17 cents richer, so…. Mr. Picky Pincher and I do keep a change bag, which we cash in twice a year. We usually get $50 out of it, which isn’t shabby at all. It just goes to show you that little things really add up. $13.41 this year. Not s good as other years but I had two surgeries this year so was out of commission for almost two months—while I may have gone out during those times, bending down was beyond me! My 6 year old seems to be the best change finder in our house! She promptly takes it home and puts it in her piggy bank on her dresser. We’ll cash in all those pennies one day….and add it to her savings account. As noted toward the tail end of the most recent FFT post, my found change total for 2016 was $17.01. But I tend to dump all mine into my thrifting fanny pack. Katy’s antique canning jar is much prettier. Also, I know that not everyone has the time, space, or inclination to pick up cans and bottles in bottle-bill states–but I’ve done quite well with this over the years. My 2016 total for NY State deposit containers was $324.10. This is a big improvement over my 2015 total in the high $200’s, because I lost some time in 2015 to out-of-town trips and injuries. And for those who think that spouses can’t be persuaded to come around to frugality, it was music to my ears to hear DH claim the first found change of 2017: 7 pennies spilled in the middle of our street on 1/2! I have no idea how much I picked up…I mostly spy coins while I’m out on walks with Mr. FG, and I always bring them home for Zoe, who is the last kid in our house with no job (Sonia babysits now, and Joshua and Lisey are employed). 1. Shopped a favorite thrift where I found an especially pretty net pot ( ‘great for the incoming cedar season). 2. Also found for. 50 each a full pad of very cute sticky notes (something I use a lot ) and a pair of olive-colored shoestrings long enough to use as a needed drawstring in a thrifted linen skirt.which no longer stays up. 3.Bought a bottle of leather dye to extend life of boots and a thrifted purse. 5. Set up electronic calendar reminder design to pay some recurring bills. Not a true fail,but was hit with $150 plus bill for prescriptions. Will double check whether that means I must meet a deductible. You certainly have the spotter’s eye. I walk every day and haven’t found a lot, even with my eyes definitely perusing the ground. But I am hopeful for 2017! Ugh, I joined the found change challenge last year and had the worst year for change ever! However, hope springs eternal. I have my eyes on the ground especially in parking lots. I once found where someone threw out 47 cents in pennies when getting their car ready to be cleaned by a detailing crew that would come to our worksite. I was happy to pick them up, but honestly, if the owner didn’t want them, why not tell the cleaning crew to keep them? I get most of my found money off the floor at Goodwill. Not every thrift store just Goodwill. I’ve never figured it out, but after the first few finds I definitely make a point to look closely. I’ve come across piles of coins dumped in parking lots a few times too. Just under $10 – $9.97 to be exact – which is the best total I’ve had since I moved to a rural area from an urban area. The city was a much more fertile coin hunting ground, especially around parking meters/meter pay stations. In fact, more than half of this year’s found-on-the-ground money came from our vacation in the city during a big music festival time period. $31.31. This included a $10 bill I found and a few ones. I end up splitting it 3 ways and it went into my kids’ savings accounts. Hubby empties his extra change into a coffee can. I’ll empty extra change from my wallet or car to add to it. When I go to cash out it’s usually about $100. Might not be as much this year as dh is bringing his lunch and drinking the free coffee at work instead of buying lunch and paying for coffee. $8.65 this year. Down from $8.80 last year. $0.10 up for 2017 already! My DD12 and I do this challenge every year, then treat ourselves to a milkshake in the New Year. I don’t have the exact total for 2016 because I counted coins on 12/05/15 then not again until today. I have $33.13 and also found a few more non US coins to give to my husband. He may have also kept a few pennies and dimes for his collection. I “rescued” a credenza from the driveway of a rental house that people had just moved out of. The inside had several boxes in it. After getting it home I went through the boxes and found a can with over $23 in loose change. Throughout this past year I also collected any found change and any found in our washing machine (it is not given back so that the kids realize that their carelessness can cause the washer to break). I have cashed in over $60 dollars. It was a team effort between my 10 year old and I. We put it in his savings account. Thanks to your inspiration, my fiancé and I started a found change jar in 2016. Our grand total is $18.64. Not as much as I was hoping for, but enough to motivate us to continue picking up pennies in parking lots and checking the Coin Stars! Yay! I beat Katy this year…$29.74! Up from last year mostly due to the $11 found at Costco. There are a lot of pennies and strangely very few nickels. I was told that by visualizing finding money on the ground, you will find more money on the ground! Nothing magical. Visualizing just makes us more aware of what’s already there so we don’t miss seeing it. I point out money on the ground to my son, he’s thrilled to pick it up (I am too if he’s not around). You more than doubled my $7.23 (which I gave to charity. I definitely pick up change but I drop it off into a little jar and don’t count it until I roll them, so I’m not sure what out total is after the jar was last emptied 2.5 years ago. I’m not coming into change like I used to – time to get out more? This is cool- we pick up change but never think to put it in a jar and actually see how much we collect for the year.. going to share this with my readers too. I haven’t kept track of all the coins I’d picked up last year, but several times that change paid for many loaves of bread and the occasional treat 🙂 Thank you for inspiring me to pick up all of the coins. Thanks for your fun final tabulation and best wishes for a found cash bonanza in 2017! You know, Susan, you reminded me about my dad. He used to find change on the ground all the time. He found perfectly good nails and screws, random pencils, and was a master at finding four-leaf clovers. His greatest find? The three-quarter-carat diamond that had fallen out of my sister’s ring a week before my dad came to her house to look for it. It was in the grass in the yard, people, and he found it! Train that son to keep an eye out for everything — who knows what he’ll find? Plus a $1 Mexican coin, 1 sterling earring and a Cabelas gift card with $45 on it! I pick up coins but don’t keep them separate from my other change in my coin jar in my closet. I need to cash that in because it is full. I told my husband and he informed me he has 10 jars!!! We are calling the bank to see if they still take it, if not – going to Coin Star and get a gift card to the grocery store (free). I don’t get much except in the washer these days. I live in the country and walking is practically impossible. I do pick up what I find but it just goes into my regular change. Husband and I put excess change in a shoebox and roll it. My DD just came and got two rolls of quarters today for the laundry room in her apartment bldg. So that is $20 in my pocket—I have a few rolls of other change but not enough to take to the bank yet. I wait until it’s $30-40 and then deposit into my checking or savings–whichever needs it the most!! I wish I could keep track of this but I can barely keep track of our spoons. That said, keep looking, money scouts! I find coins constantly and I have found $1, $5 and $10 bills in the past. Spoons: sneaky little suckers, aren’t they? Can’t keep track of mine either! I suspect that there’s an underground network for escaping spoons. But to wher? Ugh, spoons and socks….so many lost! This could be the start of a really cute children’s book. Perhaps YOUR spoons are running away with MY forks! UGH! It’s funny because I just added mine up last night! Grand total of $24.69, all coins except for a $10 bill found in front of the grocery store near my office. 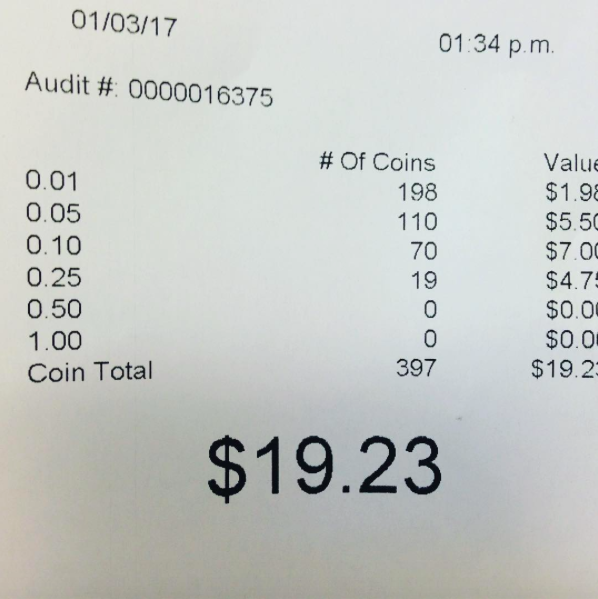 I found $9.23 of it in or near Coinstar machines and $3.50 from carts abandoned in Aldi’s parking lot. Not near as good as 2015 when I found 4 bills- 2 $20s, a $5 and a $1 and lots of coins. Lots of foreign coins-47¢ Euros, 44¢ Canadian, $4.60 Australian, a British pound, 10¢ Czech, 10¢ Bermuda and other assorted coins. All the foreign coins and 6 Chuckie Cheese tokens were from Coinstar machines. I gave the pound to my neighbor when she went to the UK to visit her mom. She thought it was a hoot! The CC tokens are given to a little friend at church who goes there with her dad. Always wanted to do this. We started this year. We will see how it goes. My daughter is an eagle eye for finding change. She always checks all the vending machines! her best hall this year was 20 dollar bill! LOL!! I hadn’t thought of it as exercise. I’m going to add that to my exercise list. I don’t even keep track of what I pick up, but that’s a great idea. Good job, Katy! 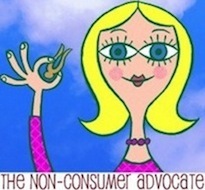 I love, love your blog, thank you for being so consistent with your posts, your posts are always so informative and fun! If it’s more than $1, I usually ask around to see if someone claims it (figure some poor soul lost their last few bucks and they need it more than I do)…but I’m off to a good start in 2017 — found a RedRobin gift card in the parking lot with $13 left on it (no one registered the card online, so woohoo!). Last year while on vacation, I found $11 cash in the Starbucks parking lot — no one inside the store claimed it, so into my son’s piggybank it went! I don’t keep track of found change, however this year I did keep track of charities who sent letters asking me for money who somehow thought it would be a good idea to send a nickel, dime or penny with their request. The total was $1.07! I really don’t understand their thinking and would never send money to a charity that sent me money. My husband and I usually put change we receive in our pockets and then put the change in a quart jar at the end of the day. When the jar is full, we each guess how much it’s worth and then take it to the bank. The person who comes closest to the correct amound gets to decide how we’ll spend it on some joint treat. This was especially fun when our son still lived at home. Short version of a related story: An elderly friend was inundated with charity asks. We hauled it all (two truck trips) to our house and went through it. We found over $100 in cash, plus loads of postage stamps (didn’t add up the value, but most likely more than the cash) and a metric crap-ton of silly stuff that charities send to tug on your heart strings. We sent “Please Remove Me” requests to hundreds of charities and it doesn’t seem to have done much good, alas. As a nonprofit administrator, I’m appalled they weren’t more responsive to the removal requests. Re gimmick enclosures: best practice should be to try to inspire, not manipulate donors. Unfortunately, it’s a numbers game, and so some continue to enclose coins, etc. because enough people do respond positively that it works for them. Personally, I call the nonprofit and speak to a human, thank them for their good work, explain I’ll never give, and encourage them to save money for their programs by removing me from their lists. That’s almost always effective. If that doesn’t work, I break out my “Stamp Out Junk Mail” stamp, use it on the unopenedeterior envelope, mark it “Returnto Sender”, and drop it in the next mail. With a sense of grim satisfaction. Ugh. “unopened exterior”, and “Return to Sender.” Teeny tiny keyboards are my kryptonite. It has been fun to add up the loose change found in 2016. I was challenged by Katy’s post last year to start keeping track. Was so diligent all year – only found $6.09….but my coworker found a $100 bill…..some people have all the luck! We started a 365 penny challenge jar with my kids this year (5, 3, and 4 months). You start on 1/1 with one penny and add an additional one each day (1/2 is 2 pennies… 12/31 is $3.65). I’m picking up pennies whenever I see them so I’ll have them ready (also doing nickels, dimes, and quarters).Totals $674 ish if you do it everyday. So many lessons for them to learn. At the end of the year we’ll put most in savings, donate some, use some for gifts, and some for a family treat. Letting the older two participate in those decisions should be fun. I didn’t total my finds this year, but I am the only person I know who goes to the mall, walks around for an hour enjoying the Christmas decorations and window displays, buys nothing, but finds $.35 in the parking lot before heading home.